70 Denison Ia. 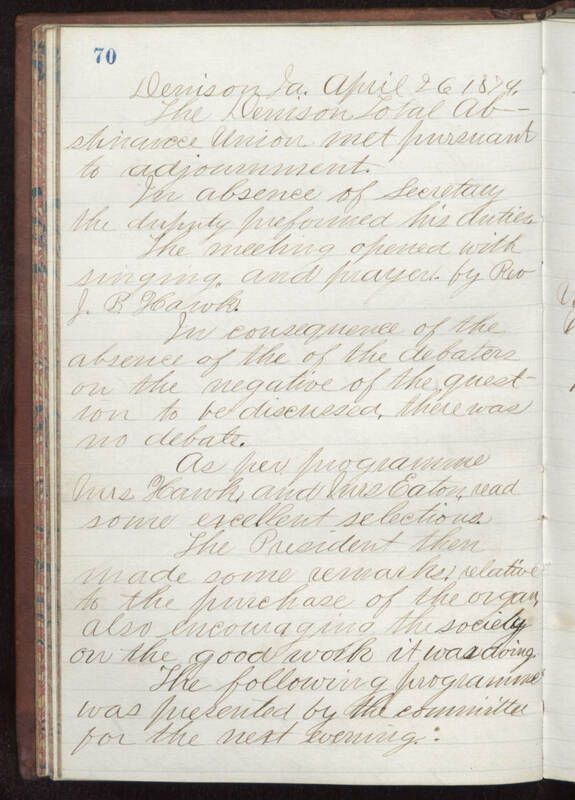 April 26 1879 The Denison Total Abstinence Union met pursuant to adjournment. In absence of Secretary the duputy preformed his duties The meeting opened with singing and prayer by Rev J. B. Hawk. In consequence of the absence of the debaters on the negative of the question to be discussed there was no debate. As per programme Mrs Hawm and Mrs Eaton read some excellent selections. The President then made some remarks relative to the purchase of the organ, also encouraging the society on the good work it was doing. The following programme was presented by the committee for the next evening.